will add elegance and beauty to your patio entrance. Garden doors, like front entrance door systems, are available with many glass styles and options such as mini blinds, grills, frosted or clear glass and plain or beveled glass. Adjusting door rollers. Doors can be adjusted for smooth operation by adjusting the door rollers through openings near the bottom on both sides of the doors. It is not always possible to find replacement rollers for an older model door. Patio door locks are in many cases not very effective, damaged or missing altogether. 'Security' is provided by wedges, tension bars and the always popular hockey stick or broom handle. However, all these measures are not effective, because all the would-be burglar has to do is lift the door out of the track to gain entry. A more effective way to prevent a break-in is to install three protruding screws through the header above the sliding patio door. This will prevent the door from being lifted out of the track. 1. Open the patio door completely. 2. Drill three pilot holes in the header where the door would be when closed. 3. Install the three screws, 3" (75 mm) long but leave them sticking out far enough to be cleared by the door. It will be now impossible to lift the door out of the track. A garden door is any door that opens to a garden or backyard. 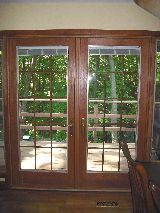 Like front entrance door systems, garden doors are available with many glass styles and options. Patio door security for 15 cent or less! !